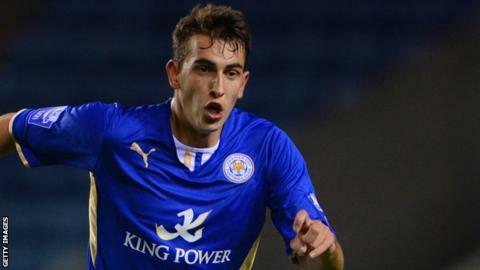 Motherwell have signed defender Kieran Kennedy, the 21-year-old having been released by Leicester City. The England Under-19 cap, who has agreed a two-year contract, started his career with Manchester City but moved to the Foxes in summer 2014. Kennedy said: "I think I have played enough football at development level and it's time to make that step up. "If I am training well and working hard, hopefully I get a chance, but I know I'll need to be patient." Kennedy, a central defender who can also play at right-back, joined Motherwell at their Dutch training base and played against both Borussia Monchengladbach and Heerenveen. "I've been here for over a week after being with the team over in the Netherlands and I've been really impressed with the facilities and the club itself," Kennedy told Motherwell's website. "I've had such a good time at both Manchester City and Leicester, both great clubs, but I've been lucky enough to get the move up to Scotland and I can't wait to get started." Kennedy, who becomes manager Ian Baraclough's sixth summer signing, is friendly with Louis Laing, his fellow defender who has joined Motherwell permanently after a loan spell last season from Nottingham Forest. "I know Louis Laing having played with him for England and, even in the short time I spent with Mick over in the Netherlands, it's clear what good players we have," he added.